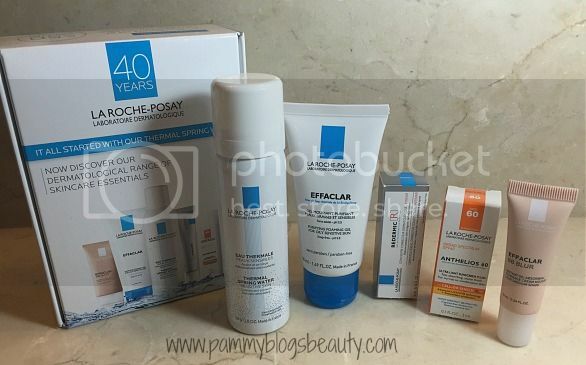 Pammy Blogs Beauty: New Skincare for the New Year: La Roche-Posay Skincare 40 Year Anniversary Travel Set! New Skincare for the New Year: La Roche-Posay Skincare 40 Year Anniversary Travel Set! The New Year always signals for a change in my routine. With the Holidays behind us, we can focus inward on self-improvement! What better time to start a new skincare routine or explore a new skincare brand! I have always been intrigued by the La Roche-Posay brand. So, I am super excited to dive into the new year with trying out some great products from them. A good way to dive into a new brand without breaking the bank is to look into prepackaged value kits. La Roche-Posay is celebrating their 40th Anniversary with this Limited Edition 40-Year Anniversary 5-Piece Deluxe Travel Set. The kit includes travel size samples of their best-sellers & fan favorites: Anthelios 60 Cooling Water-Lotion, Effaclar BB Blur, Effaclar Cleanser, Redermic R and of course, Thermal Spring Water (which is at the base of EVERY product). It’s only available at LaRoche-Posay.us until January 15 for just $15 – So, get one while you can! 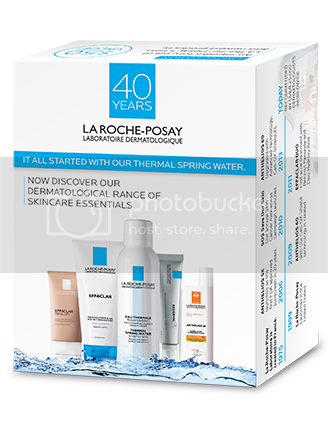 For 40 years, La Roche-Posay has been a trusted source for skincare worldwide and has committed itself to creating innovative products that stand out from others on the market. To help celebrate this milestone, the brand is offering the limited edition 40th Anniversary kit for one month only! La Roche-Posay Effaclar BB Blur (.34 FL.OZ) BB meets Blur - provides instant coverage and will result in a visibly flawless complexion in seconds. Won't clog pores or cause breakouts. La Roche-Posay Anthelios 60 Cooling Water-Lotion (.1 FL.OZ) has a unique texture that transforms like water on the skin, while providing an immediate cooling effect and advanced sunscreen protection. Effaclar Cleanser (1.69 FL.OZ) is known for solving and preventing dry skin in a minimal time period, as well as visibly tightening pores while removing excess oil. This water soluble cleanser is simple yet effective, what is there not to love? Redermic R (.16 FL.OZ) reduces visible wrinkles using a unique range of anti-aging skincare, thoroughly developed with dermatologists. The lightweight and non-greasy texture, skin leaves soft and luminous. La Roche-Posay Thermal Spring Water (1.8 FL. OZ.) promotes a healthy, refreshed and toned complexion. Infused with rich minerals, they nourish and protect the skin against environmental damage. Spray over skin during the day to boost radiance or to calm sensitive and irritated skin conditions. La Roche-Posay fans, please let me know what products you have tried and loved from this kit! Or, tell me products from the line that you recommend that are not in this kit. I am really excited to learn and try more from this line! I am definitely a La Roche Posay fan, so this little set sounds really interesting.